As the west, led by the US and prodded by France, rattles its saber at Bashar al-Assad, some in the Christian community are looking to the Bible to see what it might say about these events. They are turning to Isaiah 17:1-2 which is an oracle against Damascus. 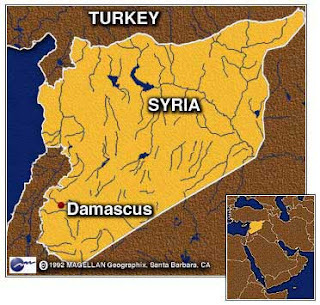 See, Damascus will cease to be a city, and will become a heap of ruins.Her towns will be deserted forever; they will be places for flocks, which will lie down, and no one will make them afraid. Some Christians, and apparently some Muslims too, see this as sign of the second coming of Jesus Christ. But there are a couple of problems with this interpretation. The Damascus referred to in Isaiah 17 is the one from 732 BC. It is the one that was mostly destroyed by the Assyrians for rebelling against their Assyrian overlords. If we are going to read 17:1-2 as a prophecy about the 21st century, then we need to do the same with Isaiah 17:3-14, which has some rather negative things to say about Israel. In fact, if you read those verses you see the destruction of Israel is described in far more detail than that of Damascus. Some have looked at these verses and conclude that it is describing a chemical attack by Syria on Israel. But in reality, it is about God judging Israel because they have forgotten God. The events described there seem to reflect the way the Assyrian army moved into Israel in 720 BC. A major problem with this sort of interpretation is that it completely ignores the context of the oracle. This oracle was written at a specific time for a specific people. It doesn’t have on going predictive powers. This type of interpretation is the result of a very egocentric reading of the Bible. It happens when we think that everything written therein is about us and for us. All that we need to do is solve the code, connect the dots and we have the secret road map to how the world will end. But as I said, this ignores the fact that what is described here has already happened. Bruggemann’s point is one for Christian Americans to consider seriously. Our egocentric way of reading the Bible often neglects to ponder the possibility that perhaps we are playing the role of a modern day Assyria, Babylon or Rome. And while the Bible suggests that God used those nations at various points in history, it wasn't because God thought they were “his people.” In fact, they are the nations that eventually met their own destruction. We should remember that God's justice has no favorites. Even ancient Israel found that out. It's not unusual to hear people make snide remarks about the Old Testament. People are sometimes referred to as "Old Testament Christians" or as having an "Old Testament answer" to a situation. I recently heard someone remark that they were going to "go Old Testament" all over someone, which I took to mean that they were going act in some violent, wrathful way. To hear some Christians talk, there is really not much need for the Old Testament in the Christian Bible. Sure there are some great stories there (Samson, David and Goliath, etc) and who doesn't enjoy at least some of the Psalms and the occasional cheeky parable. But most don't see much point to the Old Testament apart from serving as a very long preface to the New Testament. In the video below John Goldingay, professor of Old Testament at Fuller Seminary, asks a different question. Do we need the New Testament? Goldingay does a good job of explaining how much of what is thought to be "New Testament" thinking and theology is actually take straight from the Old Testament.